Leicester City goalkeeper Kasper Schmeichel has revealed what was said during the side's team huddle before their game against Cardiff City last Saturday. 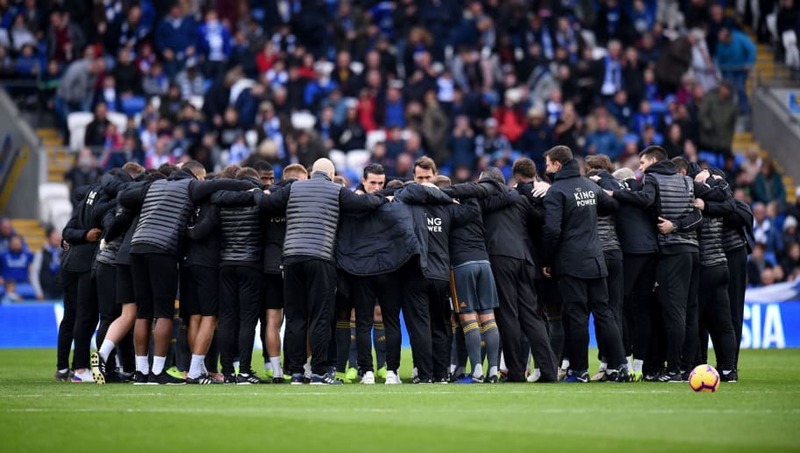 The entire Leicester squad and backroom staff came onto the pitch for a minute's silence in memory of chairman Vichai Srivaddhanaprabha, who had tragically died a week earlier in a helicopter crash. Following the tribute, they all formed a huddle in which club captain Wes Morgan and ​Schmeichel gave impassioned speeches before kick-off, with the side going on to win the game thanks to a goal from Demarai Gray. Speaking to the ​Leicester Mercury, the Denmark international revealed: "Wes said a bit, I said a bit and people had a lot to say because he meant so much to so many people. Everyone wanted to chip in. "We were just talking in the dressing room. There was no real need for game plans or tactics, it was just about controlling our emotions. It was tough but we controlled it well I thought. "We talked about having to just stick together and be what we have always been - a family. We talked about how proud we are of being here, of being part of what he has built." He added: "This week we wanted to be together. We have all lost what feels like a family member and we wouldn't have been here without him. "He brought everyone here and all the memories, the family he has built and the culture he has instilled. "The club was in a pretty precarious situation and to build what he has built is quite amazing. it's one thing building a club and a team who can perform on the pitch, but we are all proud of being part of the club he has built. "It doesn't matter who you are or what position you have at the club whether it be player or staff or stadium staff or whatever. "Whoever it may be is equal." Schmeichel and his ​Leicester side will take on Burnley in the ​Premier League on Saturday in what will be their first home game since the passing of Srivaddhanaprabha.